You’ll say goodbye to canned biscuits once you realize how easy it is to make this fluffy buttermilk biscuit recipe. These biscuits are made from butter not shortening so they are full of flavor and made from real, wholesome ingredients. This is a long post filled with details and tips for biscuit success. Scroll to the very bottom of the post to find the printable recipe. Canned biscuits caused our ruination! That was the subject of an e-mail I received after my last biscuit post. Who knew biscuits could stir such passion! Apparently, when canned biscuits made their debut, many women quit making them from scratch, even in the southern states. Carmen, the reader who sent the e-mail, went on to explain to me some of the real secrets of making great homemade biscuits and I am now forever in her debt! The most important ingredient, of course, is the flour. Not all flours are created equal. Southern bleached all-purpose flours are made from the soft winter wheat that grows well in the warmer southern climate while northern all-purpose flours are made from the hard spring wheats that grow in the colder climate. Strains of soft winter wheat have less protein than the hard spring wheat and therefore southern all-purpose flours are better-suited for quick breads such as biscuits, cakes and muffins. So, keeping in mind that less protein equals light and tender cakes and quick breads, the flours from the top of this list are going to give you the best results for those types of baked goods. And since more protein equals higher rising yeast breads, the flours from the bottom of the list will be best for those. Now that our quick flour lesson is over (I’ll be writing a more in-depth post about flours at a later time), let’s get back to baking some great southern biscuits! As I mentioned before, White Lily brand flour is the flour of choice for biscuit-making in the south. But what about those of us who can’t run to the store and buy some White Lily flour? Well, you can order it online. Or you use your newfound knowledge about protein content in flour to create your own version. Spoon flour into measuring cup and level with a knife. Measure flour into bowl. Cut in butter until mixtures resembles coarse crumbs. Blend in enough buttermilk until dough leaves sides of bowl. Knead gently 2 or 3 times on lightly floured surface. Cut with large biscuit cutter. Place on pan with biscuits touching. Brush tops with melted butter. Bake at 500 for 8 minutes or until golden brown. Cool for a few minutes on wire rack. What struck me about this recipe was that it’s so simple! Of course it gets slightly more complicated if you don’t have the White Lily self-rising flour, but it still doesn’t take much more time to throw these together than to open a can of store-bought biscuits! After doing some research both online and on my cookbook shelf, I decided to try to approximate a White Lily biscuit by substituting a mixture of national brand all-purpose flour, cake flour, and leavening for the white lily self-rising flour. For the first batch I tried using half all-purpose flour and half cake flour plus 3 teaspoons of baking powder. The biscuits were alright but they had an off-taste because of too much baking powder and I didn’t feel like they were as light and fluffy as White Lily biscuits are purported to be. So for the second batch, I increased the proportion of cake flour and decreased the amount of baking powder. I carefully followed all of the biscuit-making tips given to me by Carmen (who in turn learned them from her 90-year old grandmother), made sure my oven was at the correct temperature, and held my breath. These were the fluffiest, most tender biscuits that had ever come from my oven! Granted, I don’t know whether I have ever tasted a true southern biscuit, so I don’t know whether these compare. But these are good and they’re easy. And they don’t come from a can! Scroll down to the bottom of the post for my printable recipe! Start preheating the oven as soon as you start thinking about making the biscuits! You want the oven to be completely preheated before the biscuits go in. Prepare your ingredients and tools in advance so that once you get started, you can work quickly and efficiently: cut your butter in small pieces and put it back in the fridge, measure out the buttermilk, flour the counter, get out the biscuit cutter and baking sheet. Use very cold butter, keep it in the fridge until you’re ready for it. Work the butter quickly into the flour so that it doesn’t have a chance to even think about melting! When you add the buttermilk, stir lightly! This can be done simply with a fork. You just want to get the dough to a point where the flour is all clumped together, not a smooth dough! Knead lightly and minimally. You aren’t kneading this like bread dough, you are simply finishing the mixing process with your hands. You only want to knead a couple of times to finish dispersing the liquid through the dough. The more you knead, the denser your biscuits will be! 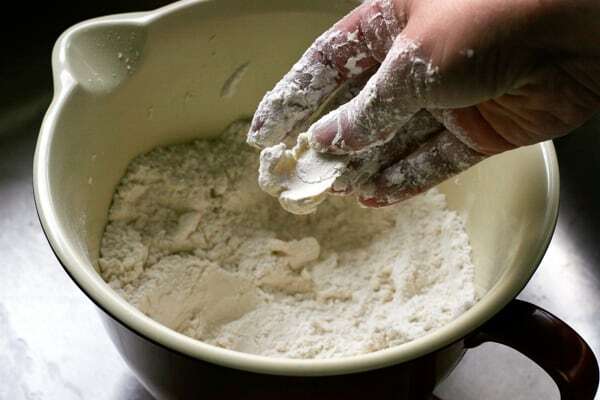 Even if you use self-rising flour in the dough, dust the counter and dough with all-purpose flour. Self-rising flour can give the outside of the biscuits a bitter taste, due to the leavening it contains. Don’t pat the dough out too thin. If you want high biscuits, don’t roll the dough any thinner than 3/4 – 1 inch. When cutting biscuits, use a sharp cutter and press straight down and up. Don’t twist! This was the hardest tip for me to adapt. I have always twisted the biscuit cutter. But guess what, it makes a difference! Place cut biscuits together on the baking sheet so that they are touching. Again, this is something I have never done. But I found that the biscuits do rise well and I really enjoy the texture of the soft-sided biscuits! Don’t re-roll the scraps. Since it is best to work the dough as little as possible, instead of gathering the scraps, re-rolling and cutting into biscuits, just form the scraps into biscuit shapes by hand. I usually end up with scraps to form two extra biscuits. They might look a little funny, but they rise as well as the others and they taste just as good! 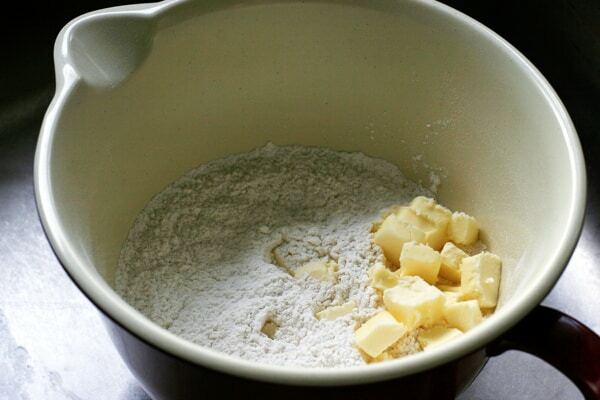 Cut butter into small chunks before adding to the flour. This makes it easier to cut/rub it into the flour quickly. I prefer to work the butter into the flour using my fingers rather than a pastry blender. Wash your hands well before beginning then toss the butter cubes with the flour so that they are all well-coated before you begin. Using only your fingertips, flatten the butter cubes and rub them into the flour. Dig your hands in and toss the butter and flour together while you are working the butter. Work quickly and stop when the mixture looks coarse with a few chunks of butter spread around that are no larger than the size of peas. After adding the buttermilk, stir lightly until the dough turns into a shaggy mass and most of the flour has been incorporated. Don’t mix any more than this as you will finish the mixing process by hand after it’s turned out onto the counter. After you cut the biscuits, place them together on the baking sheet so that they are touching each other. This makes for a nice soft-sided biscuit and is said to help them rise better. At this point, you can quickly brush the tops with melted butter before placing them in the oven. Bake biscuits in a very hot oven (500 degrees) until they are golden brown, which should take between 8 and 10 minutes. Remove them to a wire rack and let cool for a few minutes before digging in! A word on leavening: I don’t know how I managed to write this entire post on biscuits without giving you the most important tip of all! You must make sure your baking powder and baking soda are fresh! The same goes for self-rising flour since the flour contains baking powder in it. These leavening agents do not stay fresh forever and as they age, they lose their ability to do their job, which is making those biscuits (or cakes, quick breads, muffins, corn bread) rise! 4. 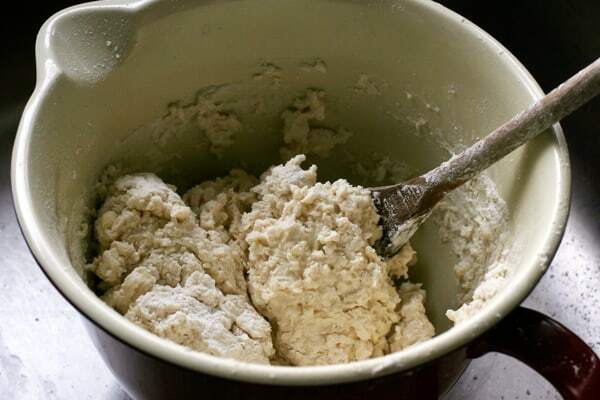 Knead dough and cut biscuits: Dump dough mixture out onto floured work surface. With floured hands, lightly knead dough a few times until it is fairly well blended. Pat out into a circle, 3/4 - 1 inch thick. Dip cutter into flour and cut biscuits without twisting the cutter. 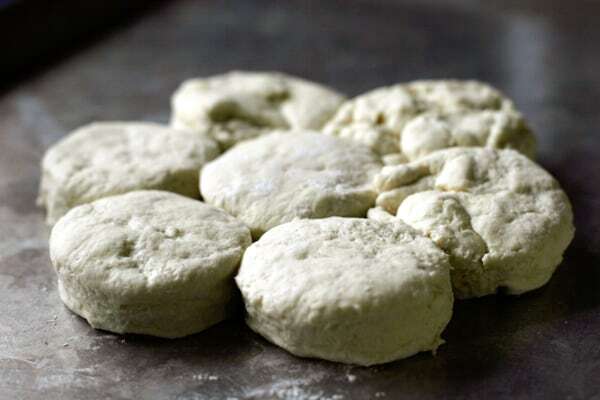 Form the dough scraps into an extra biscuit-like shape instead of re-rolling the dough. Place cut biscuits together on the baking sheet so that the sides are touching. Brush tops with melted butter, if desired. I had no idea about the whole protein content of the flours - I just learned a lot!! I admit that I do occasionally buy biscuits from a can, but I definitely prefer homemade! Nicole,Your biscuits are so beautiful. Granny will be so proud of you! Your persistance is inspiring because so many give up if the first batch isn't perfect. Once your biscuit secrets get out Pillsbury stock is sure to plumet. Bring back homemade biscuits and save the world! I thought I was going to make biscuits this weekend... Now I'm going to have to make them! Great photos, as usual.I've made biscuits before, and they're really not much harder than opening one of those pressurized tubes, with much better results. It looks like biscuits and smoked Bob Evans sausage gravy for Sunday breakfast! Thanks for a good recipe to try. Deborah: I admit that I've bought canned biscuits before on several occasions and I also used to use bisquick a lot. But for the last couple of years I've tried several different "from scratch" recipes and I have to say that these are so much better than anything I've ever made before!Carmen: I hope that this post does inspire more people to make their own biscuits. Thanks so much for your help!Curt: Can't wait to see how they turn out :-) Maybe we can compare sausage gravy recipes since I'll be posting one soon! Sometimes the biscuit tube scares me, the anticipation of pulling the triangular paper around it and all of a sudden POP! Ehhhh I can't wait to try these biscuits, I love fluffy and flacky biscuits, I can eat the whole freakin batch! mmmmmmmmmm great infor and the pictures make me want to dive right into the plate. Yum! That photograph - it is amazing!!! It makes me think of an old Dutch still-life, only with American biscuits...it is so beautiful! 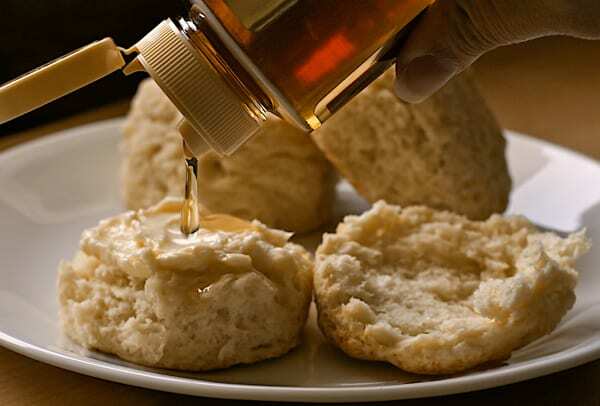 I'm sure it doesn't hurt that homemade biscuits with butter and honey is one of the the best foods of all time. Nicole, those look incredible -- and you're right -- the recipe looks so easy! Now I'm totally craving biscuits with good butter and honey...yum! Joe: :-)Steven: Thanks so much for sharing the story about your grandmother! What a great post! I've thinking about making some biscuits, but never really thought about all the different flours. I need to pay more attention now. I'm printing this out for future reference! SCB: Thanks!Kevin: Glad to have made it into your bookmarks ;-)Anali: I learned a long time ago about the difference in flours but I never really knew how much of a difference it makes. But adding the cake flour really did change the way my biscuits turned out...in a big way! Jesusgodinheaven, Nicole! [And I'm not even a religious person.] These. Sound. Amazing. And thank you for all the fabulous tips!As someone who's spent a fair amount of time in the south [lots of family there], I think Colonel Sanders also had a hand in the ruination of the southern kitchen. I remember meals on childhood visits in which a ham, a roast of some sort and home made fried chicken would join countless sides and at least a couple of pies on the table. Eventually, though, KFC appeared more and more brazenly on the table. And as with many invading, non-native species, it eventually drove out the native meals. Too sad.I will definitely keep an eye out for your sausage gravy. I'm a huge fan of biscuits and gravy, and finding decent versions thereof is increasingly difficult. Terry: I hadn't really thought about the impact of fast food chicken and biscuits on traditional southern cooking. I was all ready to post my sausage gravy recipe but I think I want to make a few changes to it now. If you're a huge biscuits and gravy fan, I'm sure you have your own method of making them. Wanna share? The Best Thing I Ever Tasted by Sallie Tisdale goes into how our culture has changed because of sliced bread among other things about food. Great book. Your post reminded me of it. Oh Nicole! What are you doing to us?! Actually, Nicole, I'm just a consumer of biscuits and gravy. I've never made it. My mom did often, but I never asked her how. In fact, when I was six or so, my dad was out of work for a while, and we went through a period where biscuits and gravy was what we ate pretty much three times a day. You would think that might have soured me on them, but they are the ultimate morning comfort food to me. So please, bring on the sausage gravy! omg your biscuits look amazing! it's torture to look at it right before i goto bed. at least i may have some buttery biscuit dreams. Renee thank you so much for the info about the book. I ordered a used one from amazon. Food does touch us to our souls and can send us into a reverie of happy memories. Our fast food, sliced bread, KFC, McDonald's, canned biscuit culture is depriving us and especially the children of something very basic and essential. When I bake homemade biscuits for my friends they recieve them as a very special gift and talk on and on about it. It was almost a lost forever art. They are so easy to make and yet so many are intimidated into not even trying. Try seving them with orange blossom honey and butter and a blissful memory will be made. Sausage gravy on homemade biscuits is an incomparable breakfast. God bless you Nicole! Carmen: "Food does touch our souls and can send us into a reverie of happy memories" -- so true! See my latest post ;-)Susan: So nice to see you! Your blog was one of the first that inspired me and really helped me hone my breadmaking skills last spring/summer (I can't believe it's been over a year now that I've been doing this!) 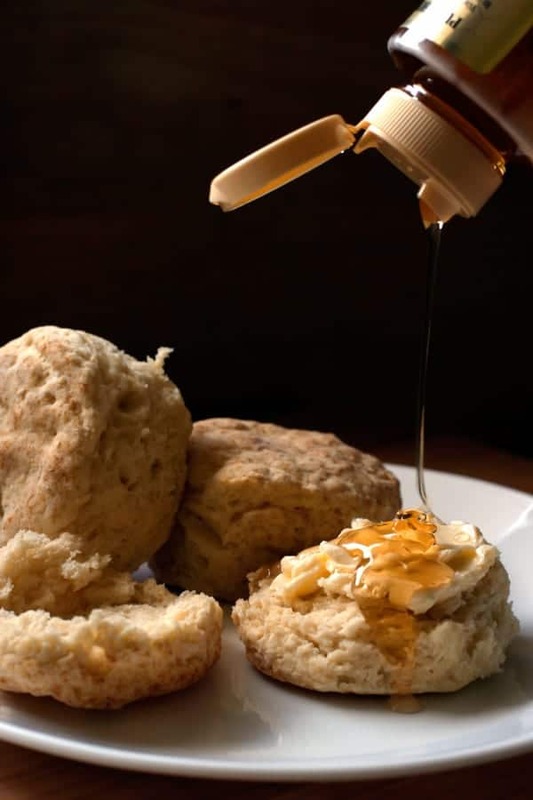 I love scones too but biscuits with butter and honey were my first childhood love (I didn't discover scones until I visited England when I was 14). You're preaching to the converted here (Canned biscuits? Never! ), but I have to say that your tips are very informative--something all biscuit novices can appreciate! Plus, as always, your photos illustrating the process are simply stunning. I had biscuits couple of times (during travel from Mc'D's):D, Never had a chance to taste really good one's. I'm sure ur's will be the best. Nicole, I finally made the biscuits today. Very simple, VERY good. They were light and tasty.I posted about them and the sausage gravy made with a fatty on my blog. We had a great breakfast this morning! Good stuff; my wife and I will be trying your recipe tomorrow AM. I was always told that the way the flour and butter felt on your fingertips was the secret to these things.About canned biscuits; there was a place in Tennessee, from whence I was exiled to Las Vegas, that is world-renowned for its biscuits. No names, but it's just south of Nashville. I arrived a little late for breakfast, and guess what i was served? CANNED biscuits. they must have thought I was a Yankee. Now I must get back out and try to find a biscuit cutter; apparently they don't sell them in Las Vegas, and my ex took all the good cooking stuff back to Alabama with her. Biscuit cutter? LOL - What's wrong with a tin can??!! Bill: Thanks for the canned biscuit story :-) Good luck with your biscuit cutter search! Like Steve says, you could use a tin can but from what I've learned, the sharper your cutter, the better.Steve: My grandmother uses tin cans that she has cut on one side to so that one side is sharp and one side is dull (for holding). She has a variety of sizes and uses them for all kinds of things like chopping up tomatoes inside a pot, etc. The problem is that I'm not sure what she uses to cut the end off the sharp side so that it isn't warped. I have some that she made for me but I've never been able to do it myself. I was sitting here, mouth open, because I had read you live in Sicily and then I saw you proposing that we throw away our precious supplies that are so hard to find and so costly here. So I clicked on About. OK, you are shopping in the commissary!For those who are not so 'fortunate' buy baking powder in the bigger tins with the plastic lid and store it in the freezer upside down. It will endure. If your lid goes wonky even a bit, seal it in one of your precious Ziplock bags.00 farina is great for biscuits and strutto (lard) is what granny used. I find it better than butter, which has some water content, but don't mind butter if you're making. I do the cutting in in the food processor, and the liquid adding in a bowl. 3 or four turns to be sure there are no lumps, then pat flat and cut. The dough is still cold when put on the baking paper-- one thing Italy does very well-- on a cookie sheet. So there is expat biscuit making! It's one of the things I make to introduce Italians to American food and they love them. I now live in California but have lived in the south for a few years. I bring home made biscuits to our chruch mens group as a treat from "dough - nuts". Finding soft flour is a challenge, so I've used cake flour to make my biscuits "float' for the guys. A little local honey, sweet butter and some canned jelly from a neighbor completes the treat for the guys. Thanks for bring back a real taste classic that needs to be found again by people who have time to discover the joy of the kitchen and the wonderful food within! Dennis: Thanks for stopping by and sharing your story! Nicole,I grew up in Ga. and now live in Colorado. I watched my mom make biscuits most of my life (I am 39). I tried to replicate her recipe for biscuits and every time I have attempted that have come out very dense but they are yummy all the same. I will try the tip on NOT kneading to much, I know hers are always doughy with she Pinches them out instead of a cutter. I am sure that when I do make them again that your suggestions will solve the problem I am having. I have to agree with Carmen that White Lily does make the best biscuits in the world. Thank for posting this wonderful information about Biscuits. They are truly a gift from god with prepared right. I forgot one more important thing. I was reading Judith's post and I forgot to mention that My Mom Always used Crisco in her biscuits instead of Butter. I am including Crisco's Recipe for them.Makes 12 to 16 (2-inch) biscuits Prep Time: 10 minutes Bake Time: 12-15 minutes2 cups sifted All-Purpose Flour or 3 cups Self Rising (leave out the baking powder) 3 teaspoons baking powder 1 teaspoon salt 1/3 cup CRISCO® all-vegetable shortening or 1/3 CRISCO Stick 3/4 cup milkHeat oven to 425°F. In a medium bowl combine flour, baking powder and salt; cut in 1?3 cup CRISCO Shortening using pastry blender (or 2 knives) until mixture resembles coarse meal. Add milk; stir with fork until blended. Transfer dough to lightly floured surface. Knead gently 8 to 10 times. Roll dough 1?2 inch thick. Cut with floured 2- inch-round cutter. Bake 12 to 15 minutes. Serve warm.I hope you enjoy this recipe. hi, something Iam doing wrong everytime i make my biscuits the always turn out hard on the top. Instead of using butter i used use lard could that be the reason and also i baked them on 350 degree. Wanda, Girl follow the recipe above and you shall have success! Bake them at 500 degrees, preheat the over, for nomore than 8-10 minutes. I brush the tops with melted butter. I mix about a teaspoon or so of honey in with 3 tablespoons of melted butter. Try it and see if that works! Rissa: Thanks so much for your comment! I'm happy to hear that you were so successful with the biscuits! Wanda: You should definitely be baking the biscuits at a higher temperature for a shorter time. By baking them at 350, you have to leave them in the oven much longer and this is probably why the biscuits are turning out hard. Let us know if the problem is solved! thany you for the info on the temp. for the oven IT REALLY WORKS!!!!!!!!!! THANKS, THANKS, THANKS. Blanca: The difference between buttermilk and regular milk is the presence of an acid that makes the milk tart. Traditional buttermilk is the liquid left over after butter has been churned from cream but the commercial buttermilk I use is milk that has been cultured by the introduction of lactic acid and bacteria. Buttermilk is thicker than regular milk and the tartness of the milk adds a special flavor to baked goods. You can easily create a buttermilk substitute by adding a tablespoon of lemon juice or vinegar to each cup of regular milk and letting it sit for a few minutes to thicken. Hope this helps! Would someone notify me as to what I could possibly be doing wrong when I try to cook homemade biscuits, the busicuits are not done in the middle. I have put my stove on 400 and I changed it also to 300, but the buscuits are still not done. They are brown on the outside and gooey in the middle.I would appreciate any information that I can get. Thank you! Marissa: Double the recipe for 10 people. I don't remember the exact number of biscuits I usually end up with but it's somewhere around 7 or 8 I think. Have fun tomorrow! Thanks for posting this very informative article. I just finished making the best batch of biscuits ever, thanks to your tips. I used the food processor and shortening but otherwise followed your technique.The stuff about protein percentages for different flours and the difference that it makes is fascinating. Another thing to consider, I think, is the butter versus shortening choice as butter has water in it and shortening does not. How does this affect the rising qualities of a biscuit? Or does it just even out with how much milk or buttermilk is used? I do know that quite a bit has been written about the differences between shortening and butter for pie crusts. I made these with Italian "00" flour and also sprinkled rolling board with semolina flour. They were as light as promised with a pleasing sprinkle of the toasted semolina on top. (I live near Little Italy in New York, so I usually have those flours on hand.) Thank you for the inspirational research on flours. I look forward to exploring your site! Hi thereI just found your blog through stumbleupon and am loving the design, nice and clean and simple. The recipes are looking nice as well and can certainly see myself making some of them in the future. I am actually looking for people with excellent food photos who want to share them with the world and interact with other foodies. I started by blogging myself about a year ago and was frustrated that not enough people were seeing the quality content I had and saw huge potential for people to share their food photos and videos with a bigger audience and ultimately drive more traffic back to their own site. Check me out at www.ifoods.tv and let me know what you think and keep up the good work on the blog! I wish I had found this before I began making biscuits from scratch. It would have saved me a lot of trial and error. My family always jokes that they never know how my biscuits will turn out. Now I know how I can make consistently light and fluffy biscuits. Thank you so much. Wow, I didn't realize biscuits were so easy to make. Thanks and they look delicious! Nicole, I love to cook and create my own recipes and sometimes change them and make my own version of them, but recently I decided to start baking, and it was a challenge, because when I cook, I eyeball everything, NEVER measure, and when baking, I found you have to measure, so the first time I baked buttermilk buscuits I did something wrong, because they looked like cookies, (no lie) LOL... they were FLAT... and hard, so I kept trying, and ended up making 6 batches before they LOOKED PERFECT, fluffy, golden brown, and about one inch thick, I was very proud, after trying six times, I felt good, BUT, they tasted a little too much like either baking soda or baking powder, I figured, too much, I was supposed to use 2 tbsp. and used about two and a half, but with only two they weren't as fluffy, in fact they were dense inside.....I baked then at 325 degrees and no touching each other so maybe that is a factor...but I'm just not sure. any suggestions???? I found this article very informative. My sister and I have been trying to hone our skills to match our grandmother's biscuit making abilities and always knew there was something about that White Lily flour. Sadly (for our biscuits, at least) we both live in Europe at the moment where it is not available. I live in Italy where Italian food is good but it's also the only thing on offer, so things like cake flour, buttermilk, and even baking powder are not available. There is self-rising flour, thank goodness, which works ok, but they never get as light and fluffy as I would like. I love this recipe! I've used it so often I have it memorized. Although the biscuits are light and fluffy they don't rise as high as I'd like. Is it because I'm rolling the dough to thin? I'd like to make those 'mile high' biscuits. Any suggestions? Other than that this recipe is fantastic!! And where can I get White Lilly flour? I got on line looking for was to saved unused canned biscuits as i only have 2 kids left at home. i am 40 and have never made a homemade biscuit in my life. my mom died when i was young as did my grandmothers. so n o help there. but.......i have just been inspired. payday i'm getting all the ingredients. say a prayer for me. i will get back on this website. I just tried your biscuits this morning! They were yummy!!! I couldn't believe how simple it was. The only problem I had was I don't have a biscuit cutter so I improvised and used a cup. It worked but I might have to go find me a cutter. Thank you for sharing your recipe! Looks good. Too bad my wife can't cook, or so she says. Today I was thinking of some biscuits, that I ate as a young child, made by a next door neighbor, they seemed so light and tasty, unfortunately, my dear mother couldn't make biscuits like that, and resorted to the canned ones, this recipe looks very easy, but I would probably make a big mess in the kitchen, so I will just day dream of the perfect biscuits and make you all hungry. I read Steve's comment about his Grandmaw using the same big bowl every morning and it brought back fond memories of my great aunts in the hills of Kentucky. My aunt Stella made the best biscuits on earth using that method. She used Martha White, then tried White Lily, but eventually stuck with the best, Hudson Cream Flour. It is like silk. All my baking taste so much better and the texture is great. Aunt Stella had a cow, so she always used buttermilk, and for shortening good ole lard. She learned to cook at age 11 when her Mom died and by age 14 she was cooking for a camp full of loggers. My great grampa always said, "Stellie , your one problem is you just make too good a biscuit". If there are cooks in heaven she wears the cap for good ole downhome cooking! Yeah! Thanks for the great info and the recipes for this Southern girl to refresh her biscuit making skills after 7 years making gluten-free ones (in other words, without regular flour)! Can't wait to try them. I've tried both butter and Crisco, I like Crisco better. My 85-year old mother uses it, and folks in our area in Mississippi always use Crisco. Either will work. I just wanted to let y'all know that besides White Lilly, Sunflower is an excellent flour, probably better than WL. I substituted pastry flour for cake flour since it's supposed to be a .5% protein difference. I think this is where my recipe went wrong since I followed everything else exactly. They tasted fine but did not rise much. I think they will be better tomorrow morning warm with honey. I will try this recipe again using cake flour and see what happens. Hi! I'm a homemade biscuit enthusiast, I just stumbled onto this website by accident.I'm always in search of the best buttermilk biscuit recipe, my mom always made them from scratch, her reason was she couldn't afford canned biscuits some households "back in the day" viewed canned biscuits as a luxury. I haven't tried your recipe yet but it sounds wonderful, I made biscuits yesterday for my hubby they were good but this recipe just might be better, tomorrow is Sunday I'll be making them again, thanks for the wonderful story! God bless you women. I'm divorcing the Pilsbury Dough Boy. Women should be returning back to the kitchen and do more by scrach with FRESH ingredients not chemicals/preservatives. Our livers can't hold the burden of clearing out the garbage out of blood streams indefinitely without health consequences. Homemade food is always best! I make my biscuits with butter and use a very large glass that belonged to my mother-in-law to cut them out so they'll be large enough to hold onto. Canned biscuits are gross.May you inspire many more women with your wonderful recipes and notes! Nicole I have to tell you- I've joined your fan club. I found your site by accident (it was 2am and I couldn't sleep) and ended up staying up until 3:30 looking at recipe after recipe. Tonight I maked your tuna cassole, biscuits, and your lemon jello cake for supper! I too have longed to make homemade biscuits and have tried over the years only making hard, rock like, hockey pucks :) I LOVED your very educational process and even though I live in northern Indiana, was able to find White Lily flour! That sealed it! With your perfect explanations and Wonderful Visuals- I didn't have to worry if I was doing it right. And Nicole- I did it right! Tall, light, fluffy- perfect! I never would have guessed you'd cook them at such a high temp but that has to be one of the secrets of success. Thank you so much. I think I'm going to try lard next time. I remember my Gran using it when she cooked. I'm not afraid to experiment now that I know I'm becoming a biscuit-making expert :) OH- and the cake was DELICIOUS! thanks again- you are definitely bookmarked. One more thing (sorry, I know this is getting lengthy) tonight I didn't look at many more recipes instead I spent my time reading the comments from other readers. They were wonderful. What a great gift you've given us by creating this site. What a great gift we've all been given/received by sharing our meals with the people we love. And sharing those recipes and memories with friends is a great way to return the gift. Jen:Thank you so much for leaving such a nice note! So glad you enjoyed the cake, it's my favorite! My 86 year old grandmother still makes it for me when I go home to visit! Let us know how the biscuits turn out with lard...I'm sure they'll be even better! Have you tried Shirley Corriher's Touch of Grace biscuits?I make them for my mom (80 years old) (adjusted to my style, of course :) ) and she tells me that they taste JUST like her grandmother's biscuits - she hadn't tasted anything like them since she was 15 and her grandmother broke her hip and never baked again.Two added tricks:1) try grating frozen butter/lard and incorporating THAT into your flour mixture. 2) try making them in a cast iron pan that you ALSO preheated in the oven. Tricky to work with, but the crust! Please I need help finding how to make buttermilk patato biscuits and not sweet patato. Do I subtitute?? I need help. I found all of the comments very helpful, but wish there had been a way to copy the recipe for the biscuits. Being a senior citizen and not computer savvy, I'm really lost when it comes to computers. I came on this site by accident. I would love to be able to conquer the biscuit while I am still able to cook. Any help would be greatly appreciated. "Happy Cooking"
Nicole....Thank you sooo much for the recipe. I made the biscuits last night and they were awsome. I guess I can now say that I've finally mastered the biscuit. This week-end I'll try the cranberry scones. Thanks again. Thanks for all the great information about flours and biscuits! I've learned so much since I started food blogging. southernplate.com has the BEST buttermilk biscuits, and she is SOUTHERN just like I am! Thank YOU! I made biscuits - and NOT with Bisquick! I've just recently re-discovered the "joys" of cooking (especially baking) and am an amatuer at best - but my God in Heaven and calling all saints, I never, ever thought that something coming from my kitchen could evoke such gunts of enjoyment as I heard this morning (first time my husband ate and enjoyed something that I cooked and didn't reference his beautiful, wonderful departed mother - that says a lot!). Nicole, your blog is awesome. Can't wait to try the Brown Sugar shotbread recipe! My 90 year old grandmother was visiting recently and we got to talking about cooking and baking. I showed her all of the recipes one can find on the Internet these days. The subject of biscuits came up and she was insulted to find people on the 'net calling biscuits "southern". Having eaten hundreds of her and my Mom's biscuits over the years I can attest to the fact that biscuits aren't remotely southern. (My Grandma and Mom are from Connecticut, I grew up in rural NY) Although the types of flour vary she commented that "Anyone who knows how to bake knows that you use bread flour for bread and biscuit flour for biscuits, it doesn't matter what part of the country you're from." (whoa Grandma... :o) ) Harder varieties of wheat are typically grown up north but since flour stores and ships well, Grandma says "We've all been using the same type and brands of flour to make biscuits for about the last hundred years or so." Her biscuits were always light and fluffy so I'm sure she wasn't using a higher protein type of AP flour. (she says your recipe for biscuits is almost identical to hers) It's a shame that homemade biscuits (and gravy!) seem to be so rare. Thanks for the recipe and reminding us how easy they are to make! Whoa, Michelle's grandma - that's a big claim to make. I know very few northerners who know how to make biscuits so she sounds like a rarity. 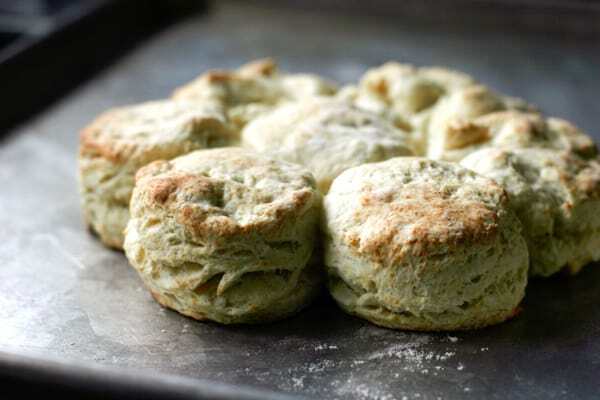 I think they became known as 'Southern' biscuits because there is another type of biscuits made with yeast that seems to have been used more in the North than the South. So perhaps because the method here was used more often in the South, they became known as "Southern' biscuits. PS. I found yeast biscuits strange and not to my liking. Nicole, I finally was able to make the cranberry scones today and they were delicious. I didn't have a lemon, so I used orange zest. I'm looking forward to experimenting with other kinds of scones. Do you have recipes for yeast rolls and pizza dough? I'll have to freeze some of the scones for my husband, so I don't eat them all. We are having a snow storm today and tomorrow, so he has to plow and won't be home until Tuesday. Looking forward to more yummy recipes. Thanks again! Made these last night (served with my really amazing spicy sweet potato soup) for my mothers 83rd birthday dinner. I have to tell you that you should have a warning to double the recipe. I almost didn't get one they disappeared so fast. Very good instructions, wonderful pictures and the background info on the flour was really interesting. My father had been a food research chemist and brewmaster and would definately have approved. I read your recipe and it is like no other recipe I have ever seen. I decided not to use it, but the thing about the protein in flour made sense. So I stole this part of your recipe and used it in my own recipe. My homemade biscuits were better than ever. I have a tip for you that I have never shared with anyone, but I feel obligated to share it with you. Freeze the butter over night and grate it the next morning with a box grater. I dont know why this helps but it will make the biscuits even better. My biscuits crumble when I pick them up or try to eat them, Why? They are good but they fall apart after cooking. Good little article. I never thought of boosting that oven temp way up. Going to give that a try. Something that I have changed in making biscuits is to stop making round ones,eitherbought a square cutter. I pat out my dough so that it is the right size to cut the biscuits without leaving any dough behind, this way I have no waste and no rerolled tougher ones. I also put them in my pan after it has heated with some butter to melt, about 1/2 inch apart. These just came out of the oven! Awesome. I followed someone else's suggestion and grated frozen butter into the flour and it all came together in minutes. Thank you for a light, fluffy biscuit and the secrets to making them same! This was the 3rd recipe of yours I tried today. What a great site! I'm looking forward to trying your recipe/method tomorrow with my 3rd grade son. We are making buttermilk biscuits for his pioneer feast and wanted to use the buttermilk left over from making butter in our biscuits. Will it work or do I need to add an acid? Since I and most all my relatives from Kentucky believe that Hudson Cream four makes the best biscuits, I looked up the protein on the label and it is 12gms per cup. Don't know how that translate into percentage as you state above, I just know it makes darn good biscuits! After countless failures making biscuits (they always come out short, dense, and dry!) I am always in search of a good biscuit recipe. I found your page yesterday, made the biscuits last night, and they were AMAZING! Very fluffy and light, they rose very nicely, and they had a nice moist feel to them also! I had never thought to use cake flour for a lighter texture, or to place the biscuits so they are touching before they bake. What incredible differences those two changes made! Thank you for sharing this recipe, it has earned a permanent place in the baking rotation! I can't wait to try this biscuit recipe. I recently made a version which included yogurt. While interesting in flavor and texture, it was not quite what I was looking for. I don't own a biscuit cutter, so I pat my dough into a rectangle (or square, depending on my mood at the moment!) and then either use a knife or a pizza cutter. My kids - now 16 and 18 - have grown up on square biscuits and never complained once :) With this method of cutting, there are no scraps to re-roll - it's all used the first time. Oooh, after reading all the reviews I am ready to head home and make some biscuits!!! PS: I have also learned a nifty trick (saw it on foodtv, I think) -- get your butter nice and cold and then grate it. Once grated, toss it back in the fridge or freezer to firm up again, and then you can easily incorporate it into your dry ingredients. No need to cut it in unless you like it in smaller bits. I've not found much difference between the two methods, so far as the end result. AuntieT: You're never going to believe this because it's just such an odd coincidence but... Just this morning I was trying to come up with a way to keep my butter cold, and yet still make it easier to mix into the flour. That very idea of yours popped into my head and I thought, "Hmmm. I think I'll try grating it then returning it to the refrigerator to chill again, next time." What a great recipe! Thank you. I have a question that I didn't see answered. When you are making a buttermilk substitute, do you need to use whole milk? Can you use a reduced fat? And lets say I was making regular biscuits, like from the Joy of Cooking using just milk, does this need to be whole milk? The biscuits I have been making look like real biscuits, they are fluffy enough, but they taste really bland. I'm wondering if it's using the less fattening milk. Any insights would be appreciated. Great question, Emily. I am no expert, but can see where it could very much matter. One of the things that makes biscuits fabulous is that nasty stuff we all try to avoid: FAT. While it may not be vital in everything, it's downright essential to getting a good end product, and making substitutions - while doable - absolutely can compromise your final product. Another thing to remember is that some of the best recipes come from the oldest cookbooks -- the ones written before there was such a beast as reduced fat milk. Back then, it was whole or nothing :) Gosh, everything tasted so much better when we were kids, didn't it? Emily: I actually recommend using buttermilk rather than the substitution if you can, I think it adds a great flavor. I agree with AuntieT that more fat in the biscuit is better, but you could certainly get away with using reduced fat milk in a pinch. I generally stay away from nonfat milk in baking though. Thanks for your suggestion. I am still not sure what I am doing wrong, or if I am doing anything wrong. My biscuits look like they should and the texture is great, but the taste is still off. I used fresh whole buttermilk, brand new dry ingredients, and kosher salt. I mixed the ingredients as minimally as I dared as well. I tried your recipe and the one from joy of cooking. They still just have a bland taste to me. Is this maybe because I am not used to eating homemade biscuits and can only compare to pilsbury and biscuits from chain restarants? When I stop to consider I don't think I have ever eaten a homemade biscuit before. I am determined to eat less packaged foods with preservates so I really want to get this right. I am trying to limit how many canned vegetables we eat, and switch to fresh as well. Any thoughts? Emily, Are you using butter or shortening in your biscuits? Butter gives much better flavor than shortening. You are on the right track - Bravo for your determination. i have been using real butter-unsalted. What a fantastic post! I am a collector of cookbooks and was sorely dissappointed when I opened up a Paula Dean cookbook only to find her recipe for buttermilk biscuits was to purchase frozen pilsbury biscuit dough! What this recipe needs is the best country sausage gravy. Dare I say I have just the one? Emily -- canned biscuits definitely DO taste very different from homemade. Give yourself time, and you will come to love the freshness of the real thing :) ENJOY!!!! Always happy to share my very simple gravy recipe. I use 1.25 lbs of bulk country sausage - from the butcher or meat department, not Jimmy Dean (too much salt). Brown the meat then add about a quarter of a cup of flour. Cook for about 2 minutes. Add one cup of chicken broth and cook for 5 minutes over medium heat. Then add about a cup of milk slowly, stirring constantly. Adjust the milk to whatever consistency you prefer. Season with pepper and parsley. Serve over the biscuits from this page (like I'm going to after I submit this post!). Enjoy! They are not biscuits in that recipe they are scones,big difference! Hey Just tried these biscuits, because of the wonderful pics and instructions on the site They are awesome I think the high heat for a shorter time is the key Thanks for the help they are going to be quite good with my grilled steak salad!! Yum double yum Thanks Bored of potatoes in Michigan! Emily:Using kosher salt in this recipe may explain why your biscuits are bland. You can't substitute equal amounts of kosher salt for table salt, in a volume measure, because the crystals of kosher salt are much larger. Different brands of kosher salt have different sizes of flakes, but in general you have to use twice as much kosher salt (by volume not weight) as an equivalent in a recipe calling for table salt. So if you're measuring 1/2 tsp. of salt needed for this recipe and using kosher, you're probably only getting the actual salt taste of 1/4 tsp. or less. So that's why your biscuits taste bland. In addition, because kosher salt's flakes are so large, they sometimes do not melt completely and evenly in baked goods, which compounds the problem. For these reasons, I don't recommend kosher salt in baking. But I don't like the chemical taste of iodized salt (like Morton's). So to maintain accuracy in my baking, I use fine-grained sea salt, which measures the same as table salt (called for in most recipes) but has a pure, nonchemical taste. You can easily find fine sea salt in bulk in a health food store or online, and many grocery stores now carry fine-grained sea salt in boxes. Buttermilk biscuits-----They were the most light,crisp and buttery biscuits that I have ever had. Great recipe! thank you for sharing. (:PS Add home made apple butter and you have dessert. I just made these and they are delicious! I used half King Arthur unbleached all-purpose and half whole wheat pastry flour (it's what I had on hand). It may have been even better with the correct flours, but I was happy with these.The best part was dipping them in soup. It made them taste like my mom's dumplings! This recipe is excellent. I didn't have cake flour, only had all purpose, so I sifted it along with the baking powder,soda,salt. Devine on a cold Christmas morning! I made these this morning for my family and they were delicious. My grands love homemade biscuits. This is the best recipe I have tried. I have tried my best in the past to duplicate my mom's and grandmother's recipe for homemade biscuits and this one comes pretty close. Thank you for the recipe. In the Marine Corps the cooks would make buscuit cutters from evaporated milk cans which have soldered ends on them. After using the milk take the can and put it top down on a burner ring set on low. the solder will melt and the top can be pulled off if it doesn't just drop off, leaving a sharp tin edge. Usually they would take an Ice pick and punch a hole in the side first , when cutting the buscuits this would be covered by a finger and when cut out uncovered and the buscuit will just fall right out. NO turning while cutting as that seals the edges and your buscuits won't rise as much. Semper Fi. Thanks for the tips. Tet68. You might consider reducing the protein content of hard flours by mixing in some rice flour, which is only about 6 percent protein. To bring a 12-percent-protein flour close to the White Lily Standard (have I coined a phrase?) of 7.5 to 9.5 percent, you could use half wheat, half rice. Of course, it would probably taste different because of the different grain, but you could test the principle to see how it applies. i just wanted to let you know that these biscuits turned out wonderful -and very forgiving!!! i made a MAJOR mistake! i completely forgot to add the salt, baking soda and powder (how? !-i blame my kids!) and realized it after i had already formed my rolls. i smashed all the rolls together into a big ball, sprinkled in the missing ingredients, kneaded it good, and remade the rolls. i ended up freezing them to use on a later day, and decided last night to try them. i didn't have high hopes, considering what i had done, but as soon as i saw them rise, i thought that i might have a little bit of luck. the real test would be the taste, and as soon as i bit into one, i couldn't believe how awesome they were!!! "crispy" on the outside, smooth and creamy on the inside. i have two cans of refridg. biscuits in my refridgerator (just in case mine turned out bad) and i am trying to decide if i want to make them (yuck-especially after having these!) or just throw them out! i most likely won't throw them away, but i don't know if i can ever eat the refridg. biscuits again!! thanks, nicole, for ANOTHER wonderful, easy, tasty recipe! my recipe book is slowly being taken over by your recipes!! thanks again!! by the way, i doubled the recipe, and using a drinking glass as my cutter (which worked really good), i came up with 13 biscuits. These were so good! I just made them with chocolate gravy and they were amazing!My husband's grandmother gave me the chocolate gravy recipe because it's his favorite. It's definitely a favorite in our house!Chocolate Gravy2 cups milk 4 tbsp cocoa 4 tbsp sugar 4 tbsp flourMix all the dry ingredients in a bowl and simmer the milk on the stove. When the milk is heated whisk in the dry mix. Whisk until mixture thickens and remove from heat. I've made these biscuits twice now, and they have turned out fantastically. So glad I found your tip about the protein content in the the flour. Kaybee - We make the same recipe for sausage gravy and if calories didn't count we would have it more often. An old timer tip to enhance the gravy - heat the milk but not to boiling before adding to the sausage and flour. Now will we all be craving homemade biscuits covered in sausage gravy? I love to make biscuits, and while this recipe is close to what I do, I have a slightly different method. I use Hudson Cream brand SELF-RISING flour. It makes things easier, but still gives great results, and I do NOT use any other brand. I have tried White Lily, and frankly, I hated it. Gold Medal might work, but I think you should stick with Hudson Cream. I also use lard in my biscuits. It is cheap (the one time I think cheaper is better), and it makes good, flaky biscuits with a great taste. I use buttermilk of course, there is no other way to go, and I DO re-roll the scraps, they are just the same as the first ones and if you don't do it you are wasting dough. Basically, I think it is personal preference, so take this recipe and experiment with it and make it taste the way you like best. Wow, you really opened my eyes about the whole "protein" thing in flour! People have told me throughout the years that White Lily is the best and it is certainly available here in Arkansas, but I learned from my mother, and she used the cheapest self-rising flour she could find, shortening, buttermilk, and she brushed the top with bacon grease. The butter didn't come into play until after they were done and we cut them open.I have kept up the tradition over the years, but I've been picking up tips here and there. I don't use self-rising flour, I usually opt to use a mix of shortening and butter in the biscuits, I use bulgarian buttermilk if it's available, and I usually brush the tops with regular milk sprinkled with a bit of sugar. (I learned that trick from "Flying Biscuit" when I lived in Atlanta. Now THERE'S a biscuit that truly does FLY. )What I've learned from you: I think I will invest in the White Lily after reading your protein breakdown and I think I'll freeze the shortening before using it.Oh, and to the reader who likes frozen biscuits: Make an extra-large batch of homemade biscuits over the weekend but freeze the "extras" (before baking) on a sheet for about an hour (or two) then dump them in a freezer bag. Voila! You have frozen biscuits for the week and I promise it's cheaper. They still turn out beautiful! Cutting the biscuits with a sharp edge,use the newer can openers that open by cutting around the edge taking off the top with a sharp edge works well. I just tried the "Fluffy Buttermilk Biscuits" recipe and I had excellent results. The biscuits were fluffy, tasty, and they look beautiful! Until now, I wasn't confident enough in my biscuit making skills to bake them for anyone else. I used a mix of cold Crisco and (frozen) butter chunks and fine salt instead of my regular kosher salt. Can't wait to bring this recipe out for guests. I'm going to try the frozen grated butter tip next time. I've purchased White Lily flour online and @ Wms. Sonoma in Houston, but it wasn't needed with the cake flour/AP flour mix. Thank you so much for all of the wonderful tips! Pappy, what a thoughtful gift and labor of love the recipe book for your family will be. How blessed they are to have such a Pappy! I know this blog post is pretty old, but I just wanted to say that I noticed in the pictures that your finished biscuits are "freckled," which is the result of not properly hydrating your dough. After you get done mixing the ingredients in the bowl, you need to let the mixture rest for about 25 minutes so the flour and leavening have a chance to absorb the moisture. The "freckles" that you see on the biscuits are bits of dry mix that burned in the oven.I would also recommend buying a digital scale and converting your recipe from volume measurements to weight measurements. It's a more consistent way to bake, and it makes it much easier to tinker with the formula. Just wanted to say i typed in buttermilk bisciuts, and came to this post, i just finished eating some of the best biscuits around, i love the texture and taste! definatly TWO THUMBS UP!!! Thank You! I would like to make these for Easter brunch but I will be very busy with other preparations. Can these be assembled the night before, kept in the fridge, then baked the next morning? I can't imagine why not, so long as you cover them with plastic wrap so they don't dry out. If you'd had time, you could have done them and frozen them. I've not ever tried that, but am told it works well. Good luck, and Happy Easter! I premake my biscuits all the time and freeze them-perfect for when you only want 1 or 2 for supper, or if you don't have time to make biscuits from scratch. They come out of the oven just as good as when I make them fresh. Honestly, this recipe is so good that I really don't think you can mess them up!! I can only assume that putting them in the refridgerator the night before would be just fine. Good luck-although I really don't think you will need it! Thanks for jumping in, AuntieT and Joni! I haven't made them ahead of time myself, but I see no reason why it wouldn't be fine. I do that with scones and they always turn out well. I went ahead and formed the biscuits and kept them in the fridge overnight covered with plastic wrap. The next morning, my nice puffy biscuits had deflated to heavy disks. I went ahead and baked them and got rave reviews. However, I'm sure they would have been fluffier if not pre-assembled. Hmmm...maybe there's a reason that the store biscuits are pressure packed?Joni -- when you say that you freeze biscuits and heat them later, do you mean you freeze the dough or an already cooked biscuit? Mary-I freeze them BEFORE I cook them. I just throw them in a freezer bag once frozen and pull out however many I need at the moment. It works great! And they come out just as fluffy as when you bake them immediatly. Like I said-this is a great way for the extras when you make a double or triple batch (which I do all the time! It helps out for dinners on the weeknights when I have 3 kids "starving". Fry up some eggs, pull out the biscuits and cook up some bacon. Viola! Egg sandwiches!) Hope this helps!! i love these. they look so scrumdiliumcuious and yummy:P. you should make some for me. Do you mind if I quote a couple of your articles as long as I provide credit and sources back to your webpage? My blog site is in the exact same niche as yours and my visitors would certainly benefit from a lot of the information you provide here. Please let me know if this alright with you. Appreciate it! I have been making biscuits every Sunday morning for a few years, while my ladies are still sleeping. They have always been good and I have been trying different recipes to make them just that little bit better.I had the "bright idea" to look on the internet for the "best buttermilk biscuits", just to see if there was a better recipe. What I found was your better technique. I had been doing exactly the opposite of what was right - trying to work the dough to make small pebbles of butter and buttermilk and overworking it.These biscuits were EXCELLENT. Better than my Mom's and even my Mamaw's (may she rest in peace).I had to improvise a little and did not read some of the follow up advice until later. If it gets any better next week, I don't know if I can stand it.Growing up in the north, from deep southern families, my two favorite foods were fried chicken and biscuits. If you have the perfect recipe for chicken, let me know.I am going to get up early next Sunday and make my Mamaw's "bow-legged gravy" (bowl of egg gravy).Grateful in East Texas. OMG! These biscuits are AMAZING! I made them for father's day and when i tasted one i instantly thought of Cracker Barrel biscuits! They are literally exactly the same! If not better..... :) Thanks so much for this recipe! Any one looking for a fluffy buttery soft biscuit recipe this is totally it! OMG! These biscuits are amazing! I just made them for father's day and the minute i tasted one i had an instant flashback to Cracker Barrel biscuits! They are exactly the same!!!!! If not better...... :) Thank you soooooo much! Any one looking for a fluffy buttery soft biscuit recipe this is totally the one! Rach: It could be that the biscuits were rolled too thick so they needed more time in the oven or perhaps the oven wasn't hot enough (it needs to preheat for quite a while to reach such a high temperature). If you find that one is undercooked, you can pop the rest back in the oven for a minute or two. I just bought a bag of grocery name brand self rising flour but after reading your article and the higher protien content of regular self rising flout I decided to buy some softsilk cake flour, add the baking powder and salt to make it self rising cake flour. I then combined these two self rising flours to get a product with a lower protien content and will have to use this until I can order some White Lily self rising flour. I used the two combined flours and followed the rest of the recipe (just adding butter and buttermilk) and they were the best biscuits I have ever made. They were light and fluffy and delicate and we just loved them. I can't wait to try the White Lilly, but these were the best I've made ever so far. A tip I did see somewhere though was to once the flour is combined with the butter and buttermilk, press out lightly with your fingers then using a pastry scraper fold the dough into thirds and press out again. Do this three times and you will end up with light, fluffly and very flaky biscuits. It works! 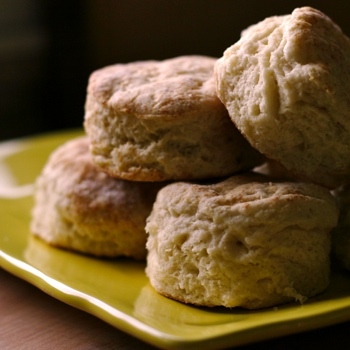 These are the best and easiest biscuits ever, well after I got my flours mixed together. EXCELLENT biscuit recipe. Mine turned out wonderfully even though I had no cake flour. Thanks for the inspiration. Thanks so much for this recipe. I tried 3 or 4 before this and none turned out. The only tip I would give is to make sure you have FRESH everything! Wow, these are amazing! Got it on the first try too, thanks for going into such detail on this recipe. I shredded the butter instead of cubing it... got a little carried away and added an extra 1/4 c. So what effect does adding the melted butter to the top have? I have made these biscuits twice!!!! Both times PERFECT!!! Forgive me but I also used another recipe and put it with yours just because of the different flours you use. Can i just use the exact measurements of flour if I use White Lilly Flour? I would like to just go to one recipe instead of going to two different recipes each time I make some biscuits. Also I noticed that the first time I made them they were too sticky is it okay if I just add some extra flour in? Thank you so much, everyone loves my biscuits thanks to your wonderful tips and recipe. Thank you again. Well everytime I try my biscuits are very dry and not too tasty. Yet as they say I will go back to the drawing board and try your recipe. Thanks for the good info. Pictures are good as well. Michael, feel free to add extra milk as needed. If live in Arizona (dry, dry, dry!) and I almost always have to add extra. Sometimes it's just a couple of tablespoons, but once in a while I need more than that. You just don't want your dough to be super-sticky, but even if you end up there, just gradually kneading in a bit more flour takes care of it! Good luck! Michael, feel free to add extra milk as needed. If live in Arizona (dry, dry, dry!) and I almost always have to up the liquids in recipes. Sometimes it's just a couple of tablespoons, but once in a while I need more than that. You just don't want your dough to be super-sticky, but even if you end up there, just gradually kneading in a bit more flour takes care of it! Good luck! Amanda - yes, you could definitely use real buttermilk for these. But if your buttermilk isn't from cultured butter, you might want to stir in a bit of lemon juice to acidify your buttermilk and help it act like a cultured buttermilk would in the recipe. I made these last night. Terrific!! The biscuits were super fluffy and moist. I had enough dough to make two separate batches, so I made one set with biscuit cutters and one set without. Both were great, but I will say that the ones I made w/o cutters (just cobbled together by hand) were even flufflier and more delicious? I've heard that and see it in recipes - directions saying that for the fluffiest biscuits don't use biscuit cutters and wanted to test it out. Regardless, I had a quick question. The texture was perfect, but I think I'd like the biscuit taste to be a little more savory and flavorful. Do you have any suggestions? What happens if I keep all the measurements the same except for butter and add more chunks of butter to the recipe. Will that mess up the balance of the ingredients? Thoughts? Thanks for a great recipe! It's been my experience that If you add more butter, it will make them more crispy. Some like them that way.I like savory and flavorful too. I sometimes stir in cheese and drizzle butter and garlic on top once I lay them in the pan. Those are amazing and I can never make enough. So, this is kinda a response to a comment from waaay back, from Steven I think. He said his grandmother kept her flour in a big bowl and made batches of biscuits by dumping and stirring everything in the bowl, and that he had yet to find another person who did this. My grandmother also makes her biscuits that way, and it was always captivating to watch her, she just seemed to know the exact amount of shortening and buttermilk to add. And being from the South, I can attest to the awesomeness of White Lily flour. It's the only flour my grandmother will buy, and it always turns out the fluffiest biscuits. Quantifying an individual's continue iphone 4 unlock at&t PPPPP Full Article once and for all simply by education basic principles [b]how to unlock new iphone 4 [/b] [url=http://howaboutunlockiphone4x.info]how to unlock iphone 4 for tmobile[/url] Have you any idea Tips to http://howaboutunlockiphone4x.info ? The net is a potent method providing you with absolutely everyone on the net the way to get in touch to one another, collect enough detailed information online and luxuriate in simple expertise want shopping online and also banks. However, millions of people Web surfers have steady chance adware and acquisitions which will make you and me particularly at risk of detrimental will act. how to unlock iphone 4 4.1 Area and the boat boast. Continue Reading Have you figured out Tips on how to [b]iphone 4 unlock sim [/b] [url=http://eazilyunlockiphone4firmware.info]unlock iphone 4 without sim[/url] Subject http://eazilyunlockiphone4firmware.info . Just found White Lily flour and when comparing their recipe to yours I noticed the White Lily recipe has no salt, baking soda or baking powder. I assume the soda and powder are missing because it is self-rising flour, but what about the salt? If I use the White Lily recipe, will my biscuits be bland without the salt? Should I add salt even though their recipe doesn't call for it? Thanks for your help! Just made this recipe, and it is phenomenal!! Plus it didn't take that long to cook. Thank you! Thanks for the recipe! Found this about 9 months ago and tried it and followed it to a >T and biscuits turned out perfect. 7am in the morning and I'm thinking about doing them again, and again dipping them in local honey for my allergies. Happy baking! I stumbled upon this blog whilst lookin' for a good buttermilk biscuit recipe. I asked my friend, whose mom-in-law is Texan, for hers, but no buttermilk and she uses Crisco, which I don't have or like. I forgot about the different protein contents of flours too. Baking is a cool science, with some love added of course. I will try your biscuits tomorrow, but have to go get some cake flour. I am using northern unbleached ORGANIC flour. A tip I learned is to keep flour in the fridge IF it's sealed. Flour goes rancid very quickly especially in a warm climate, and you may not even know it's bad. I also ALWAYS freeze my butter and use a cheese grater to add it to the flour. I use it for mashed potatoes too this way. I learned this trick from an old friend whose Mee-Maw was from Texas. Anyway GREAT blog and love the comments as well. Cheers, ladies! This guy can't wait to git to bakin'! Really good post! I like the technical details, especially because you are not too technical. Interesting and technical that doesn't get into boring. ;-)How does Gluten free flour, such as King Arthur GF or Tom Sawyer GF flour fit into the above? Vacuum cleaners with bags need to be replaced frequently. For electric ovens check the elements and wipe over. Of course, because a vacuum appliance is very important in our lives, we must do all we can to make sure that service continues for a longer period of time. If ?ome one neds expert view regarding blogging after t?at i s?ggest him/her to visit this weblog, Keep up the nice work. I always enjoy finding out how to improve making biscuits. I'm from Alabama and have tasted lots of different biscuits over the years and liked most of them. I always use a fork making biscuits because our home economics teacher told us about the boys that had been in shop had made biscuits and left little pieces of grease in them. Hardee's, McDonalds and Jack's here make the best biscuits and some people don't do a good job with their recipes. Now that is talent. Thanks for sharing. I always enjoy the personal stories of how everyone has a different tradition.